Premium skincare miniaturised! This discovery set contains perfectly proportioned travel sizes that look great, and luxurious formulations that work to soften and soothe the skin. Contains the Monsieur DeRide Fresh Wrinkles Corrector to minimise signs of ageing, the Monsieur Shaving Cream to soften the beard and provide an exception shave, and the Monsieur Face Wash to cleanse and reduce shine. Get the perfect shave wherever you go with this travel-friendly kit containing a genuine badger shaving brush. With its infusion of fresh lemon essential oils, this miniature products provide the perfect wake-up call for the skin, softening and smoothing it both pre and post shave. 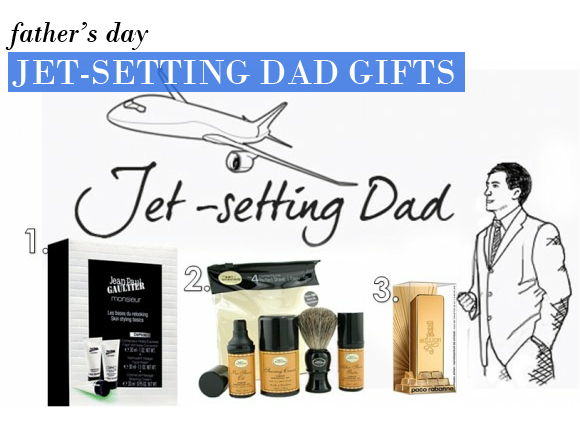 Each of the products meets the requirements for safe air travel, making it perfect for jet-setting dads. An ideal way to carry the inimitable 1 Million fragrance, this handy travel size slips discreetly into pockets and hand luggage. The distinctive fragrance scintillates the senses with notes of Blood Mandarin, Peppermint, Rose and Amber, and suits luxury lovers down to the ground with its bold gold ingot casing. The addictive and seductive Eau de Toilette is a modern classic. This entry was posted on Monday, June 13th, 2011 at 1:00 pm and is filed under Gifts. You can follow any responses to this entry through the RSS 2.0 feed. You can skip to the end and leave a response. Pinging is currently not allowed.